Gallstones are stone-like deposits that form in the gallbladder, a small pear-shaped organ located under the liver. The gallbladder is responsible for the storage of bile, a greenish-brown fluid used in the digestive process to digest fats. Bile is made in the liver. Gallstones develop when crystals form in bile, the liquid stored in the gallbladder. Over time, the crystals can grow into hard, stone-like lumps. 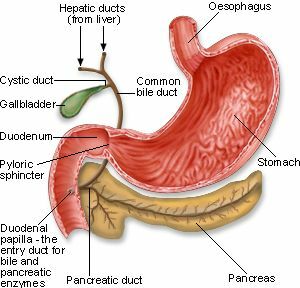 Bile consists of a number of components, including cholesterol, bile salts, bilirubin and water. If your gallbladder fails to empty properly, or if the cholesterol, bile salts or bilirubin become too concentrated, you may develop gallstones. Gallstones may be tiny, like a pinhead, or as large as a golf ball, and may vary in number from one to several hundred. Lots of small crystals can form so-called 'biliary sludge'. Cholesterol stones are the more common type of gallstones. They are generally a yellowy-green colour, and can occur if your liver produces too much cholesterol. Pigment stones occur less frequently. They are small and dark brown or black in colour, and consist of bilirubin salts. Pigment stones tend to occur in people with cirrhosis of the liver, biliary tract infections or certain blood disorders. About 10 per cent of the general Australian population (and 15 per cent of people older than 50 years) have gallstones, although they often do not show any symptoms. taking certain medicines, including some cholesterol-lowering medicines. 1. NHS Choices. Gallstones (updated 18 Nov 2013). http://www.nhs.uk/conditions/gallstones/pages/introduction.aspx (accessed Aug 2015).